We really love toys and entertainment that spark the freedom for play and creativity. Kids are often peg to classroom settings of schedules, rules and regulation, that they sometimes forget to think freely and creatively. We came to know about Citiblocs from My First Games. And its founder, Pamela has given us some for play and review. Pamela is a Mother of 3 and firmly believes in the numerous benefits of playing games. Mums do really know best after all. Citiblocs are good for both individual and group play. Some days, Js build alone and some other days, they decided there's more achievement in teamwork. Each box contains 100 pieces (comes in 50, 100, 200, 300 or 500) of precision cut building blocks, in assorted and natural wood colours. All same in shape and size. It's all as simple as it looks, no glue, no magnets, no connectors or clasps. All you would need is just some good imagination to explore gravity and balance. These blocks are made from Grade A Radiata Pine from certified renewable forests in New Zealand. Some great wood they are. of precision cut building blocks, in assorted colours of greens and browns and natural wood colour, and all in the same in shape and size. Constructing structures with CitiBlocs precision cut building blocks is done without glue. There are no magnets, no connectors, no snaps nor clasps. Together with the ever-present force of gravity, all you need is a good sense of balance, and an active imagination! The award winning (17 Toy Industry Awards!) CitiBlocs blocks are made from Grade A Radiata Pine from certified renewable forests in New Zealand. - See more at: http://www.myfirstgames.sg/citiblocs-100-camo.html?search=citiblocs#sthash.H6RcN0lG.dpufFrom left to right, the Cool set consists of blue, turquoise, lime green, dark green and natural colours. Camouflage set comes in shades of green, brown and natural colours. Hot set comes in red, pink, orange, yellow and natural colours. While the natural is only of single shade. If you are one perfectionist, cleaning up will be strictly categorized into their original state. For Js, as long as they all fit into each box without bulging. It's one toy they often play now, cleaning up must be made easy. So then, we introduced the time table of ten. Stack 10 sets of 10 to get 100. Instead of counting painfully to 100 to fit each box, we broke down the counting. Yay! Maths and cleaning up become partners. Alternatively, it's always easy to get a bigger box to fit all in. Easy peasy lemon squeezy. Citiblocs is an easy play that needs no instructions or explanations. Js opened it, and at that very instant knew what to do. It really is one great toy for self play. For the initial, they didn't think of mixing the blocks, but I hinted them not to be restricted. Use whatever they needed and allowed their imagination to soar. We didn't want to get back to the classroom setting of, "No". Jazz built a local tourist attraction, which she claimed to be Chinatown. And she went on to mix the colours, built a fitness studio with a kick boxing and dance studio. So those blocks were her imagination of sand bags and mirrors. I thought it could be constructed higher to include more levels. And for the boy, he attempted a carpark with ramp for his toy tanks, and did up a secret compartment for storing his tiny toys. So then, I decided to take a closer look into what he has between the blocks. There were his toy stormtroopers and 'weapons'! How did I not realised he had so many troopers around the house?!! Oh well, however they wanted to build on that imagination. When they ran out of ideas, they would go to the book of ideas, included in each box. There's really more construction that's far and beyond your imagination. They had much fun out of it, and to train patience and perseverance, we can even get them to build a series of domino effect. When one collapses during build up, they will patiently pick up the fallen pieces into position again. Gravity and balance do require load of patience and trying. I love it, when it comes to testing their perseverance. And I will affirm, it's one good play that will last through the growing years. You won't believe even the grown ups attempted to play with it too! Get your Citiblocs fun, online at My First Games. Citiblocs will go on a 30% discount, whilst stocks last. Check out with discount code: CTBTHIRTY. While shopping, don't forget to check out their wide selection of boardgames too. Free delivery for purchase above $100. The season of giving is not too far away! Have fun shopping. Disclaimer: Citiblocs were given for the purpose of this review. All photos and opinions are solely ours. We've met our first Santa of the year! LEGO Santa has arrived at Legoland Malaysia to brighten up this festive season from 20 November 2015 to 03 January 2016 with their very own Holiday Extravaganza. And you know the park is very ready for Christmas when you spot the deer, with Santa and his sleigh. Ho ho ho! This Christmas, Santa has brought with him not just 24, but 30 windows for the life size advent calendar in Legoland. Just so we have more chances to win amazing gifts. All you had need to do was to enter the draw before night falls. Guests would have to get a show guide from the guest services office located in the park, within the show guide, you would find a lucky draw segment to fill up and tear out. Drop it in the lucky draw box located near the festive stage/LEGOLAND express. Winners will be announced and have to be present during the announcement to claim the prize. For us, looking for LEGO Santa was our mission of the day, but we decided we should play first! The Star Wars exhibit is a must see, simply because Jare is a huge fan of it. That being our second stop after Jazz's adventurous roller coaster ride with the man. After which the weather got a little more moody, it decided to snow rain. We took shelter before deciding to venture when the rain got lighter. So yeap, for that frequent prediction of rain this monsoon season, do remember your raincoats and brollies. We did ours this way. Never mind the grown ups. Fun continues in the light rain. Jare has an achievement this year, the last round we visited, almost exactly a year ago, he was barely tall for most rides. This time, he met the minimum height requirement to ride the dragon's apprentice, the mini roller coaster. He was sure a happy boy! We went on to build cars at the Build and Test Centre, where there's no limit to creating an ideal sports car. Speed does matter in a race after all, never mind the aesthetic part of it. Js realised. We went for a few more rides before the sky turned gradually dark. We needed to find Santa to light up that huge Christmas tree made of duplos. He has the key to lighting up that tree. We gathered at the LEGO city stage (Festive stage) to meet the casts from their Holiday Special show. And of course, Santa appeared! There's also where you will see the life size Advent Calendar, a winner everyday. Looking at that snowy decoration on the trees, we had really wished it was snowing. But it was raining. It's Asia, we know. And we were shoving in and out of shelter to catch glimpse of Santa. So do remember your brollies and raincoats. Leave the snow boots home though. No fret, there are lots of sheltered activities and great shows indoor. There's always a good hideout if weather gets too wet or hot. And yay! We caught Santa in the Market restaurant after the light up. That got our day well summed up and we were all ready to head home and battle the jam at checkpoint after a good Christmasy dinner. Ok, not a very bad jam actually. It wasn't a full day out, but we were fairly exhausted, even the kids. Age is catching up on everyone! Head on down to Legoland this Christmas season. There's a special little something for 15 lucky kids every Friday to Sunday for the whole month of December. Write your wish list of LEGO products at the Big Shop, and have 15 of these wishes transform into reality. Dreams do come true! Also, if you've been eyeing the annual passes, this is a good time to purchase. In this season of giving, you can purchase four passes for the price of three. Bring theme park joy to the kids this season! Disclaimer: We were given tickets to the park for play and to witness the Christmas tree light up. All photos and opinions are solely ours. 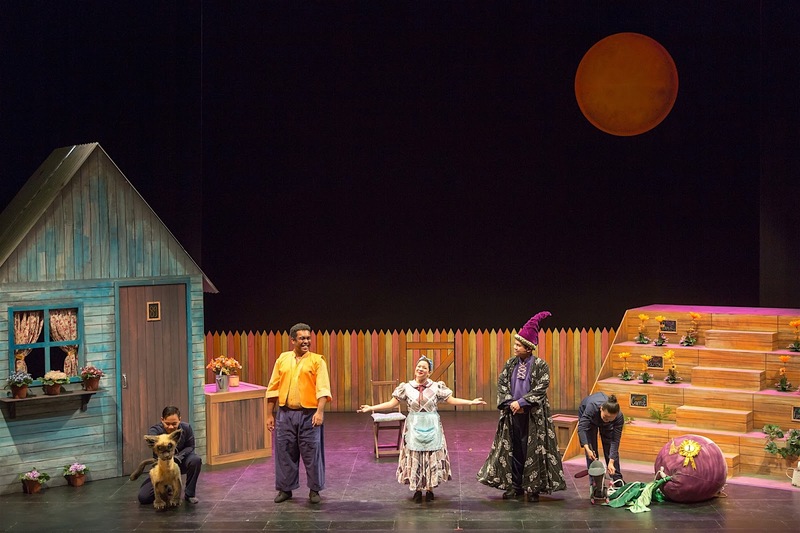 We had a wonderful weekend catching The Enormous Turnip play, presented by itheatre. A 50 minutes fast paced show that is bound to keep our kids well entertained in their seats. It's interactive with fun and memorable songs, as well as a clear moral message for everyone. Where did the Enormous Turnip come from? Who is strong to pull it out of the ground? And what will they do with it? With much good leaning points, we had our answers all solved in this wonderful play. It was shared through the play that horse's poo is a good fertilizer for plants and that we need to make good efforts to keep our plants away from pests like the caterpillar. There's some hard work involved in success. Little Eek, the mouse was tasked to help care for the plants, but something nasty happened beyond his control. That incident shed him of his roles and duties going forward. What will he do from then on? Eek's dream is to be noticed, but he is SO small. What good use can he be in the vegetables garden? It was only till the very last scene, the farmer saw his contribution and appreciated him. We saw too, the power of teamwork. Js take away from the play was that no role or character is too small to look down on. The show cleverly displays its brand of professional actors, unforgettable songs, mask and puppetry with wonderful stage props and magic! Yes, check out how those vegetables and turnip grow. It certainly did amuse Js. The show was all interactive too. Little volunteers were needed to help tug and pull the enormous turnip out. The young audience was stirred with cheers and was extremely responsive to the show. Just how wonderful these little children are. One thing for sure, everyone enjoyed the play! So did I. It's definitely one good play to catch this holiday period. Don't forget your meet and greet session after the play! Disclaimer: Tickets were given to us for the purpose of this review. All photos and comments are solely ours. Do your kids love getting their fingers in finger puppets? Js love finger puppets and I see the immense benefits of it while they play. When coordinating their fingers, the brain also coordinates the story and hints them which fingers to put down, up, bend or wiggle. It's some motor skills in there. There's also language development, expression and sometimes the release of emotions. We learn to take turns in giving those listening ears when someone is narrating his made up story. Whether realistic or fantasy, it's just hilarious listening to Js stories whenever I'm the audience. I would say finger puppets are some essential play in their category of toys. We were excited to receive and review a set of Fairy tales finger puppet busy book from Royal Rae. Jazz is a lover of made up stories, and was the first to get her fingers on those puppets. For some days, we had a switch of night schedule. Instead of bedtime stories, we do puppet show and tell for a refreshing change. This book is amazingly crafted. It's not any hard or soft covered books, but a cloth book with 16 finger puppets within. It can be neatly and conveniently zipped for any travel too. The characters are from 4 popular fairy tales - Red riding hood, Goldilocks, Snow white and The three little pigs. 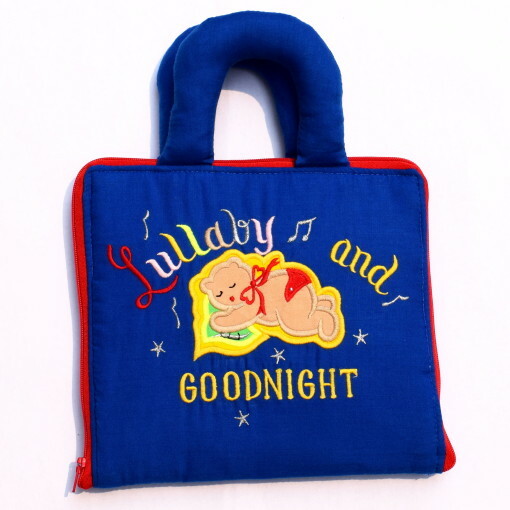 All carefully designed to be durable, safe and simple for little kids. It was most wonderful to watch how the kids weave in the various characters of different stories into one big story. The idea, imaginations, flow and language were good learning points for them. You may even compliment these puppets with the storybooks found in your home. Royal Rae was founded by Cecilia, who discovered that her daughter often preferred handcrafted toys over her other stash of toys, and how these handcrafted ones better encouraged her daughter's creativity and imagination. This explains Royal Rae's selection of high quality toys to engage kids. A Mum often knows best. These busy books are especially great for entertaining kids during travel, on flights, in car or waiting for food in restaurants. I love how these busy books keep the kids positively occupied with almost no weight added to the Mum's bag. Together with our busy book, Cecilia had very kindly and generously included 2 sets of "Design your own snakes and ladders." It was most useful for Jare, who is still trying to master the art of reading. The snakes and ladders turned stickers are free for the kids to design where they would like to paste their snakes and ladders. After which, they will fill the spaces with numbers 1 to 50. Some numeracy skill in there too! The reading comes into picture when the pawn lands on the head of the snake and one can 'escape' from moving downwards by reading a card of 10 words from the stack of Dolch sight words. So yeap, there's no doubt in the range of educational and quality toys you can find in Royal Rae. Js had great fun playing with the busy book and game, very engagingly and meaningfully. Good things must share. Explore the website and if you would like to shop for any products (Christmas is coming! ), you may check out your cart with the following discount code, mumscalling10 for a 10% discount on all purchases. There is also a special 20% discount if you are keen in the 'Lullaby and sweet dreams' busy book with the following discount code lullaby20. Codes available till 28 November. 3. Join Royal Rae's mailing list by signing up with your email here (Scroll all the way down). 4. Tag 3 or more friends in this Facebook post, whom you think will love this giveaway. Giveaway closes on 25 November 2015. All the best! Disclaimer: We were given the mentioned products for review. All opinions and photos are solely ours. Last weekend, Js had a wonderful time making pizzas at Crust Gourmet Pizza Bar! Not for play, but for consumption. It's always nice that they learn to work for food at times. We were very warmly welcome into the cosy little restaurant with little chefs hats and aprons. It was most thoughtful that doodling materials were prepared for the little ones to design their master chef hats. Great 'entertainment' while waiting for their go in the kitchen. Crust pizza was first launched in Australia and widely known for serving delicious pizzas with the freshest ingredients. It started franchising in 2007, and that's how it landed in Singapore with 3 outlets at current - Holland Village, Upper Thomson and Serangoon Garden. Their appeal is that they have a wide selection of premium meats, fresh vegetables and gourmet cheeses. Quality is also maintained during delivery (If you choose to party at home with pizzas). There is the vegetarian and gluten free range for different diet requirements, as well as sides such as chicken wings, wedges and salads to complement your pizza party. First, they learned to put on their gloves for hygiene. Hats were abandoned because they thought they would look funny in it. Js created a really simple pizza for their tummies. Tomato and cheese for Jare, mushrooms and spinach for Jazz. If your kids are small eaters, a kid's sized pizza (9 inch) is good for two. You might realise Js have got a beautiful rolled out crust, but not one they kneaded and rolled. The dough was made and brought in from Australia. Some recipes are just not capable of being well tasted in our humidity. After baked, the crust stays amazingly crisp and fresh. I have a special love for pizza crust, and this is one that tastes really good to my liking. I had preferred it thinner, so the kids' round pizza appealed more to me. The adults pizza seemed to have a thicker crust (from the same dough) and it ain't traditionally round. It's rectangular, 13 by 8 inch. So who says pizzas are always round? Oh man, it's just torturing to be writing this near lunch. Well, it's great to know that I have now an added option to my home pizza party! Oh wait, I do need to check if they deliver to my venue. Certain locations only, so do call and check. Delivery is for a minimum order of $25 (Charges apply, depending on distance). Free delivery for $200 and above. Have you tried crust? If not, the best time is now or soon! Here's a special treat our readers. FREE kids 9-inch pizza with every pizza order. Quote "CRUSTFAMILY" when placing order. Available for dine-in, takeaway and delivery. Valid till 31 March 2016. Don't miss this! Disclaimer: We were invited to a pizza making session with Crust. All opinions and photos are solely ours. And so... we will bring you into a little secret of ours, or rather not so secret. We are 16 weeks! We are expanding by another 2 little feet, we have promotions and shift in ranks within the family. Jare will have a little minion and Jazz will have 2 little minions to boss. Yes, we are excited to be welcoming the smell of another baby after this long. It was planned, it was wanted and we had really wanted just one more. We know the pink or blue too! It was most natural that the girl wants a little sister and the boy wants a little brother. I'm not kidding you, but I really prayed, almost earnestly for a pair.... of twins! fraternal twins, a boy and a girl. Oh well, this doesn't run in our hereditary history and I guess, God didn't want to give us what we couldn't handle. ONE is perfect. I sneaked coloured cream into their cupcakes. Told the kids that their cupcake has got a colour inside. If it's blue, it's a little brother, if pink, a little sister. A little of bad photography and lighting. But you got it, it's BLUE! And so was Jazz disappointed? A little she said, but she went on to proclaim that boys are cute. She rattled on, "Actually Jareth is cute, I asked him to draw a heart, he drew me a peach. I asked him to draw a machine, he drew a shoe and I asked him to draw an apple, he drew a heart. He's funny!" And for Jare, he was almost expressionless. He checked out his cupcake and went, "Why is there blue? What is your colour, jie jie?" I almost fainted. Did he think it could be different?!!! As for us, the parents, all we can ask for is another one healthy little boy. I'm thankful that he will complete us. Three has always been on my mind. Just three. FULL STOP. Though I've to admit, I've been so comfortable with Two. The thought of gloriously graduating from parenting babyhood and toddlerhood was just so complete. Now that pregnancy comes again, we will welcome it with tremendous joy. Some decisions needed to be made early just to deter the word 'regret' from creeping in later. It will be sad looking back at something you could have done, but did not. It just bothers me a little when older folks I meet, often tell me to have more children. It must be some golden advice I can't relate to or have the experience as of yet. My friends who are trying to conceive, trust me, you've been constantly in my prayers. May there be joy and celebration in due season. Keep trusting and praying. Pictures of behind the scenes when we tried taking the 'pregnancy announcement' photo. Now we know why that boy has been beaming so widely. I am so thankful too, for friends who have been really patient and understanding with me, I'm ready to venture out more often now. I've taken victory over morning sickness, no more scrambling for plastic bags or running to the toilet bowl. I'm looking and feeling more like a human now. The past weeks took a toil on me. It felt almost like Js were malnutrition and left to care for themselves, while I juggled between morning sickness, decent meals and motherly duties. Glad I'm back, almost in full function. Thankful too, for my Man who stood between the gaps of my lapse. You ate whatever I could present on the table during this period of time, regardless the taste or texture. Anticipating our brand new alarm clock next April! Oh, if you don't mind just some clicks away, vote for our 'pregnancy announcement' picture here please? Trying to win some baby goodies since we've given much away. Thanks in advance! Treasure Island is a classic adventure novel by Robert Louis Stevenson. It follows the adventure of Jim Hawkins, a lion-hearted 13-year-old girl who receives a treasure map from a kooky old seaman. 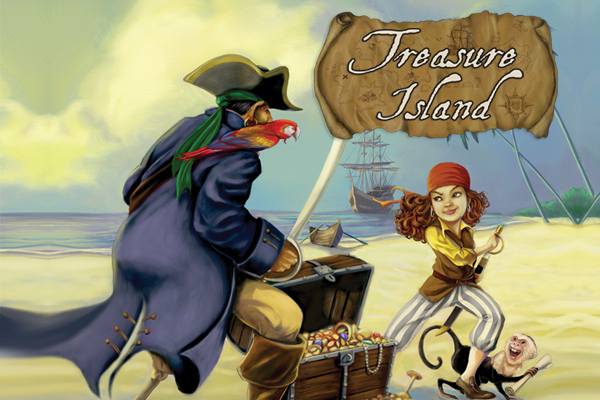 Jim is tasked to help find the hidden treasure, but the road to riches is never smooth sailing. 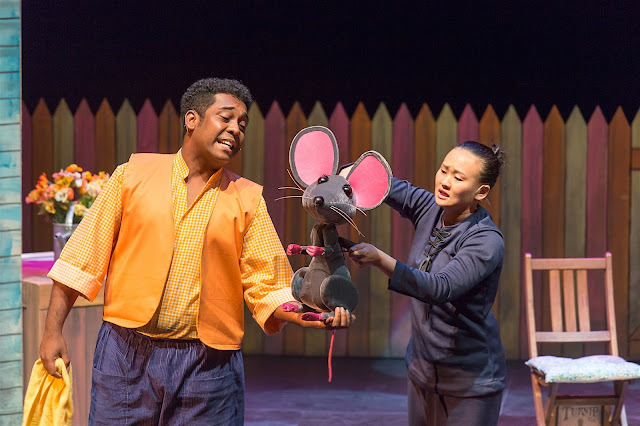 A new adaptation of this popular novel is now stage playing at Singapore Repertory Theatre, The Little Company. The battle between Jim's party and the pirates will be the highlight to follow through. How does it begin and how will it end? 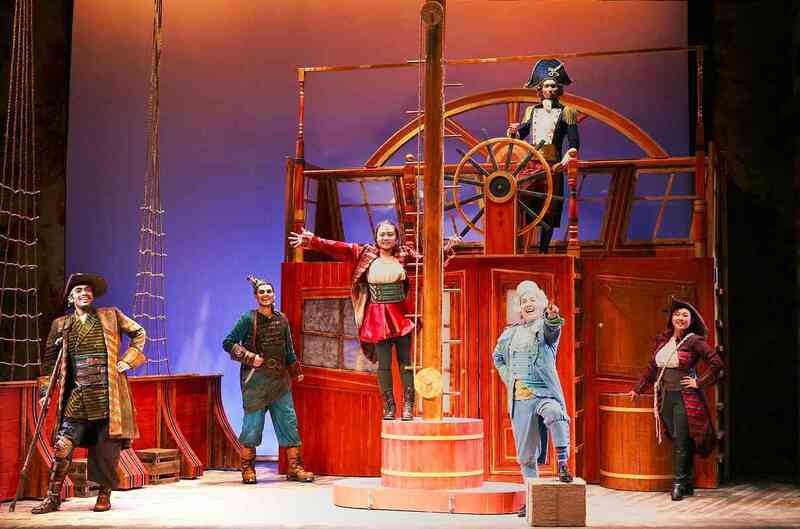 We can only say, be sure not to miss this swashbuckling, action-packed musical about friendship and trust. As the play claims, it will keep your entire family on the edge of your seat. I believe so, because SRT's productions had never once fail the parents and kids! This is yet another one to impress. Wait no longer, it's The Little company's one final play before the year closes. Treasure Island is on stage from now till 13 Dec 2015. Tickets can be purchased from sistic. Flash giveaway ends this Thursday, 12 Nov. Be quick and Good luck, Matey! This giveaway has ended. Congrats Ang Chris! Our resort adventure begins the next 2 days upon arrival. Land sports and water activities did not quite define our character, plus we had young and old folks in tow, it seemed better to stay tame. We had planned for some beach and water play instead. That's how boring we are, I guess. We explored the resort on a Monday and Tuesday. It was bare empty with few humans doing any activities. Sounds very much to our advantage, but it really feels like some drowning business in there. We discovered 2 pool areas, at different parts of the resort. One seemed more for adults and the other with shallow pool and slides for kids. We went for the latter of course. Towels were also readily available by the pool. Complimentary. So you know, you get excited and hipped kids when you tell them they are going for a dip in the pool. There were 2 winding slides to get on for play, but were unable to whoosh down smoothly without any self help, we had to push ourselves down during mid way. The kids enjoyed their water and slide play nonetheless. Just be cautious that one of the slides ends in the deeper pool. After water play, we paid for the kids to get their hands on some batik painting. Which Jazz thinks is the highlight of her trip. Batik painting with frame was about $16. It takes some time for it to dry and frame, so we collected them the next day. The kids friendly activities in the resort were mainly the swim pool, beach for sand play and kids club where you can pay hourly to have your kids play in an enclosed area with toys and activities. I think there will be a child sitter to care for the kids, while parents can take some time out. Everything in the resort has to be purchased and paid for if you would like to engage or use it. Some other activities were Karaoke, board games, table soccer, outdoor gym, games room and quite a few others which we didn't interest us much. All transactions in and out of the resort are in rupiah. You may also feed the kois! Purchase a pack of fish food ($4) to feed the kois in the pond, just outside the hotel's lobby. Exploring the beach is a must. The blue waters beneath and clear sky above made up a really scenic view. No haze. Quite a gem sight, I thought. Even though nearby, we don't get such a true blue nature in Singapore. We brought along beach toys for play. However, it gets crazily hot in the late morning. Do prepare loads of sunscreen, caps, sunglasses and water. There are a couple of deck chairs with large umbrellas, but good shade is a contradicting find on any beach. We finally found a coconut tree to shelter the kids for sand play. For the folks who doesn't quite like the sun and heat, you'll be thankful to be sipping drinks in the restaurant by the beach, while watching your kids play. Outdoor and indoor seating available. Drinks bar opens in the morning, but lunch begins at 11:30pm. Oh, do note, Bintan is an hour behind us. The Rice restaurant serves a good mix of food, Chinese, Western and Indonesian cuisine. Fire crackers?!! Looks fun. If we saw this in the night, we might try. We needed an early lunch on our final check out day, so we hopped over to another restaurant at the Golf area. Forgot its name, but many restaurants were not open for lunch near its main lobby. Do get staff to call check for you, before bugging over. We settled here with an almost similar menu as Rice, a mix of cuisine. We ordered their Indonesian cusine, Gado gado and Nasi Goreng. They were good for eat, but not anyway near yummylicious. On the day of check out, all you had needed to do, was to stay in your room at the time the resort advised. Their friendly staff will come for the baggage to assist check in, at the ferry terminal. After which he will come for his guests, to send them over on his buggy. He does the room check out too, if there are no outstanding payments. All easy and convenient. Needless to say, we had tremendous fun with our personal buggy! The thing we will miss about our stay. It was a rejuvenating get away from the usual mundane tasks. Anywhere, anytime and quality time with the people we love is always a good breather from life's busy days. Up in the next final post will be our venture out of the resort.